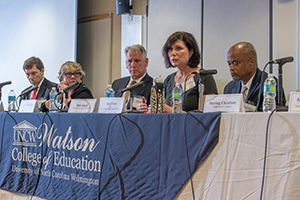 On Dec. 1, the Watson College was host to the GradNation Wilmington Regional Community Summit, convened by UNCW’s Watson College of Education Dropout Prevention Coalition. More than 250 educators, community leaders, parents and students attended the event. Morning and afternoon breakout sessions featured successful programs that are helping to enhance student success and increase high school graduation rates. Topics included early intervention, student mentoring, mental health, the role of student resource officers in schools, faith-based support, arts and recreation, early colleges and various services offered by nonprofit organizations in the region. Larry Scott from Rachel’s Challenge was keynote speaker. Rachel’s Challenge is a motivational anti-bullying program that has been adopted by schools around the world, including 120 schools in Southeastern North Carolina. Jonathan Barfield, Sterling Cheatham, Lisa Estep, Connie Majure-Rhett, Tim Markley and Ron Zapple participated in a lunch panel presentation titled “Community Support for Our Schools and Students.” Barfield is chair of the New Hanover County Commissioners, Cheatham is Wilmington’s City Manager, Estep is a member of the New Hanover County Board of Education, Majure-Rhett is president and CEO of the Greater Wilmington Chamber of Commerce, Markley is superintendent of New Hanover County Schools and Zapple is a New Hanover County commissioner. The final session of the day featured a student panel discussion on obstacles faced and opportunities available to high school students. Attendees said it was important to hear students’ perspectives and several called the messages “powerful.” The participating panelists are members of the local student organizations Girls Rocking It in the South (GRITS), Young Moguls and LITE Manhood. Aquil El-Amin, a student at Wilmington Early College High School, served as panel moderator. The summit was co-sponsored by America’s Promise Alliance as part of its GradNation campaign, a national movement of dedicated individuals, organizations and communities working together to raise the national high school graduation rate to 90 pecent by 2020 and increase post-secondary enrollment and completion. The Wilmington Regional Summit was one of 100 summits being held around the country through 2016, with generous support from AT&T. Watson College professors and Dropout Prevention Coalition (DPC) co-coordinators Janna Robertson and Robert Smith planned the summit, with a team that included DPC Advisory Board members Clifford Barnett, Judge J. Corpening, Matt Edwards, Susan Finley, David Hand, Beau McCaffray, Deloris Rhodes, John Shannon, Judy Stubblefield and Stephanie Willis. Nicole Geczi, administrative associate in the Watson College dean’s office, managed logistics for the event and Robertson’s daughter Jessie designed original artwork for the program cover. Robertson said the outpouring of support from organizations throughout the community humbled her. 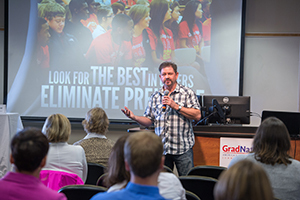 “I had over 20 student volunteers and dozens of moderators and presenters. More than 200 people attended the event in person, and another 50 participated via webcast. We had good media coverage but that wasn’t the best part. It was the ideas!” she said. 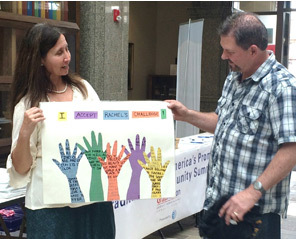 Robertson is just beginning to compile outcomes of the summit, which already include increased support for Friends of Rachel Clubs in schools, plans for a regional event for Rachel’s Club members to be held at the university, mental health training initiatives for teachers and youth workers in the community, a sharing of ideas and planned collaborations between schools and community organizations. A blog authored by Robertson about the summit was posted on the GradNation website and can be viewed here: www.gradnation.org/blog/wilmington-dropout-prevention-about-relationships. The UNCW Watson College of Education Dropout Prevention Coalition was created in 2011 to raise awareness of the high school dropout problem in the region and to bring together a broad audience representing schools, colleges, government agencies, community organizations, businesses, the faith-based community and other interested individuals to find ways to help students stay and succeed in school. The coalition now has more than 1,000 members. For information visit www.uncw.edu/ed/dropout/. America’s Promise Alliance leads the nation’s largest network of national organizations dedicated to improving the lives of children and youth. GradNation, the organization’s signature campaign, mobilizes Americans to increase the on-time high school graduation rate to 90 percent by 2020 and prepare young people for post-secondary enrollment and the workforce. For information visit www.AmericasPromise.org.